We need to transcode your uploaded PDF files, in order to display them correctly in all browsers on desktop and mobile devices. As you probably know, color profiles can be a tough nut to crack. Nonetheless, we are able to handle PDF files both with RGB and CMYK color profiles. 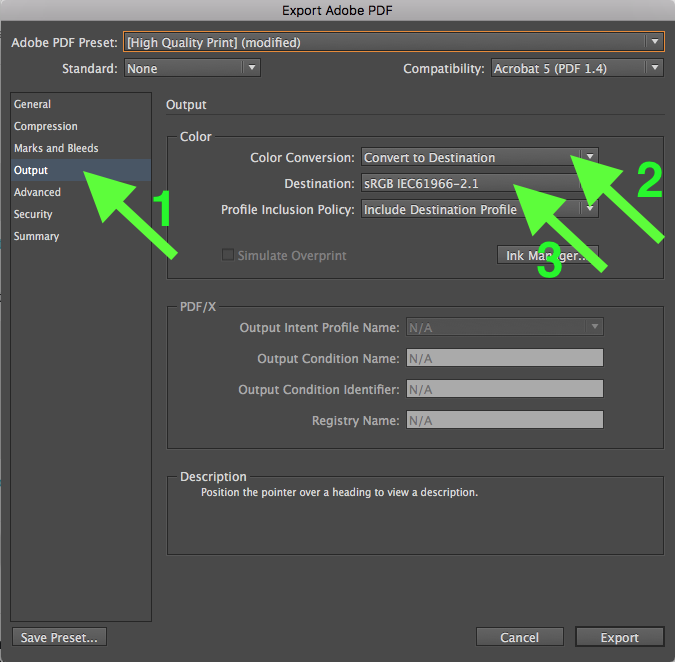 To ensure maximum color accuracy, we recommend to set up and export PDF files with the “sRGB IEC61966-2.1” color profile. In case your file has CMYK elements or you are not sure which color profiles are used, you should make sure to convert your files to “sRGB IEC61966-2.1”. In the export dialog, switch to the “Output” tab. For the “Color Conversion” option, select “Convert to Destination”. As “Destination”, select “sRGB IEC61966-2.1”. Now, you are ready to export your file as PDF and to upload it to Filestage!